The place has a rustic feel to it. 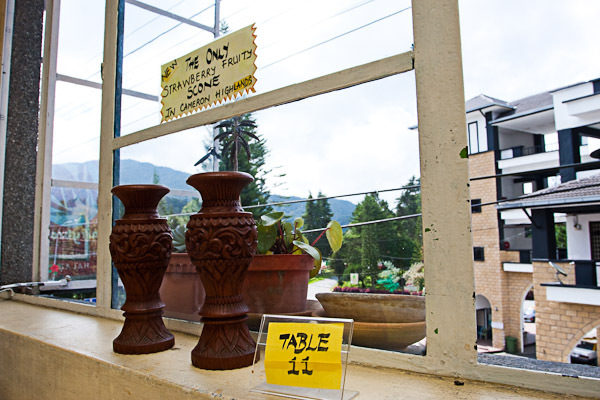 Rattan chairs, wooden tables and small potteries with beautiful plants were arranged neatly with artworks donning on the aged-paint walls. The menu was simple. Western, Asian and local delights were to be found in it. Since I was famished, I opted for their late breakfast set with a cup of black Malaysian coffee to go along with it while my friend ordered cream scones and chocolate milkshake. 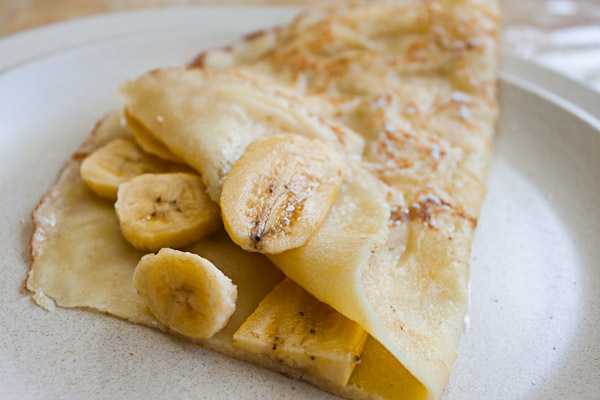 A portion of banana crepe was ordered to be shared. My breakfast set (RM6.80) was simple and hearty at the same time. 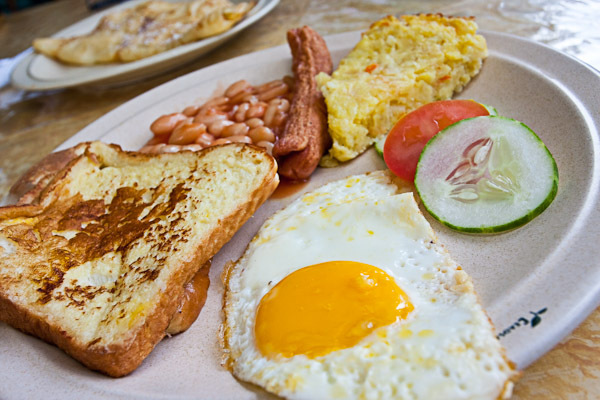 Two slices of French toast, sunny side up egg, homemade hashbrown, baked beans and a sausage were placed nicely on the plate. The toasts were soft and eggy but there’s nothing to shout about for the sausage. The egg was fried nicely with wobbly runny yolk at the center. I particularly liked the homemade hashbrown as it was delish. Albeit it was a little cold (probably due to the chilly weather… and my obsession for food photography), it was slight mushy with a little bit of crunch from the bits of carrots in it. The aromatic Malaysian coffee (RM1.90) was perfect end note for the breakfast meal. 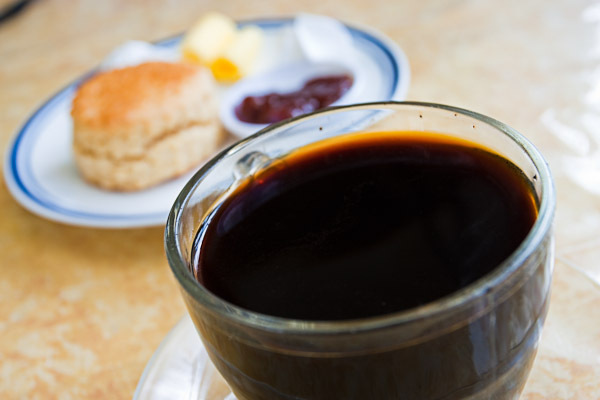 Bold and strong, it was just the way I like my black coffee to be. 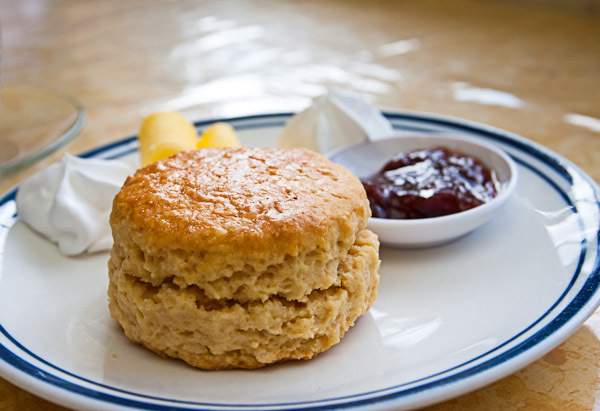 Now, I’m not a big fan of scones. But after having T Cafe’s cream scones (RM2.50), I finally understood what’s the fuss all about and why people raved about it. Crumbly in texture yet buttery in flavour, it’s good to eat it on its own but it’s equally good with the side condiments; whipped cream, homemade strawberry jam and butter. The banana crepe wasn’t bad either. 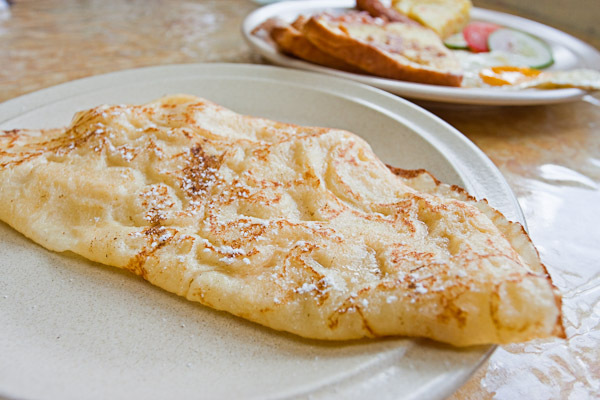 The portion was decent with good amount of sliced bananas hidden inside the soft pancakes. However, it could do better with a scoop of ice cream or a whirl of chocolate / strawberry sauce as it was rather plain. Unfortunately, I didn’t manage to grab a photo of the chocolate milkshake (RM5) but I did take sip and I was amazed by the thicknesss of it. It’s akin to ‘drinking’ chocolate ice cream with a straw. All in all, we pretty much enjoyed our meal. 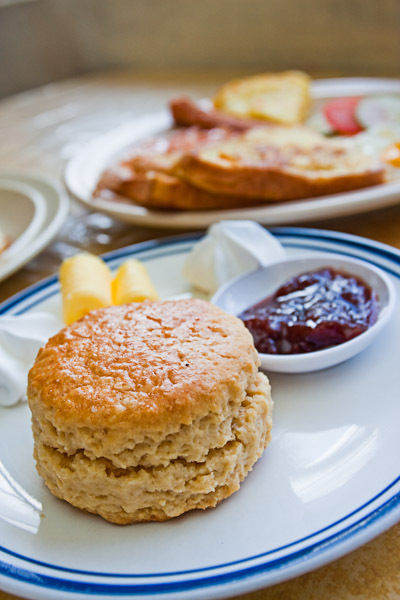 I’m not sure how the main meals fare but the ones, which somehow falls into desserts category, we tried especially the scone and pancake were good. 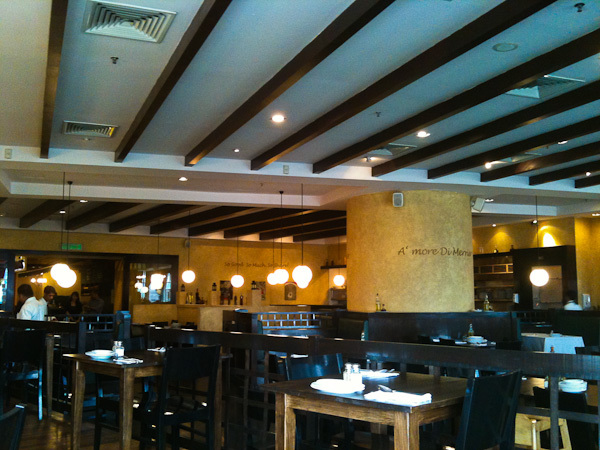 The calm environment was homely and I reckon it’s a place to go to for simple meal or just for a drink. Choices are abundance when it comes to food selection in Mid Valley Megamall (including The Gardens Mall). However, if one takes the cost of each meal into consideration, problem will arise as the choices will be limited to just a few; namely food court, fast food and probably kopitiam. And we all know the reaction we get/show after having a few rounds of the same type of food at the same place. But thankfully, there are a handful of the restaurants that offer set meals; let it be lunch or dinner, in order to capture a bigger crowd who want something more fulfilling (to the tummy) and yet not hurting their wallets/purses at the same time. There are quite a lot (of restaurants) that I know of that offer set meals during peak period. 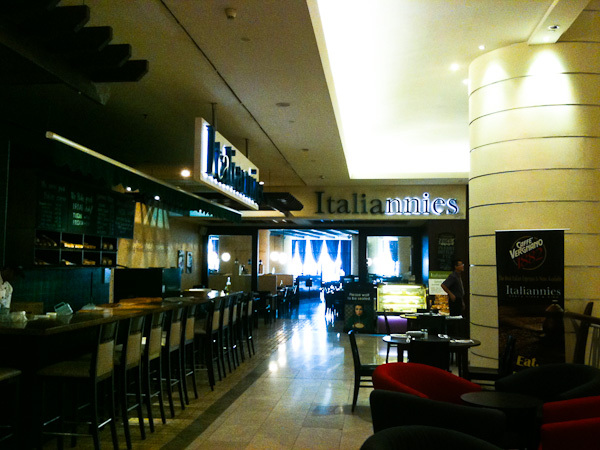 And one of those is Italiannies whom is well known for its hearty Italian food at affordable price. I first came to know about this offer when I walked past their signboard moons ago. Then, I didn’t take it seriously as I was either rushing to somewhere or too full (from a meal) to think about it. 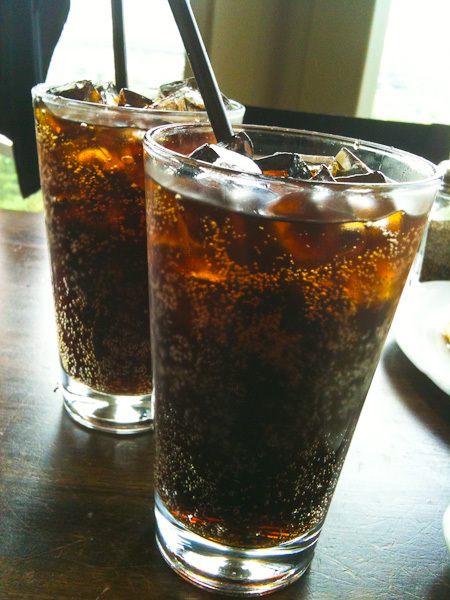 For RM15.90 (onwards), one could get a soup or salad, main course and a bottomless Pepsi. That’s a pretty good deal I would say. 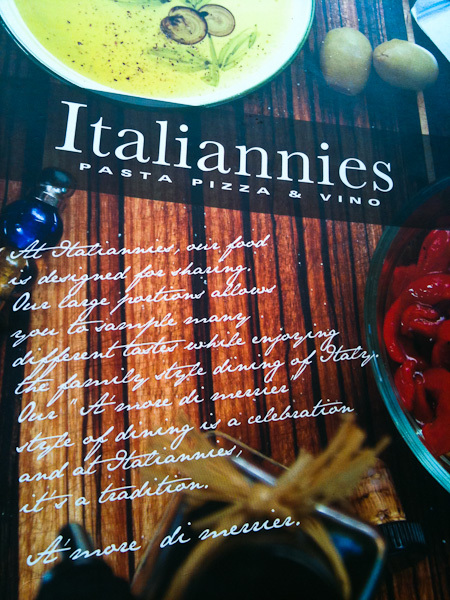 The menu is pretty extensive as it offers salads, pastas and pizza. What’s more is that there are dishes that cater for vegetarians too! Besides, I was surprised that the portion was pretty decent… as you know, many places will most likely to cut down on the portion due to “the value of the set meal”, if you know what I mean. 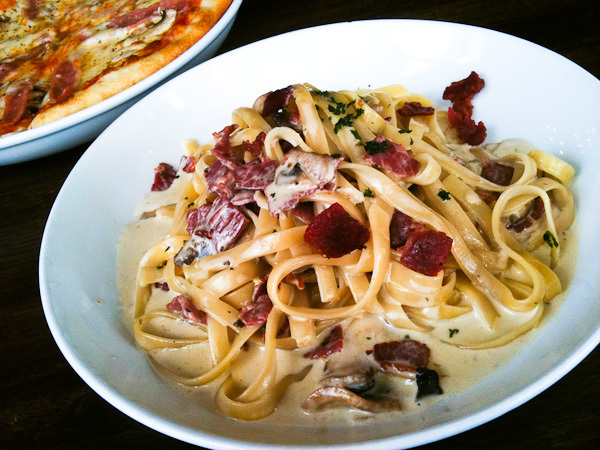 After all, Italiannies is famous for its big portion meals. 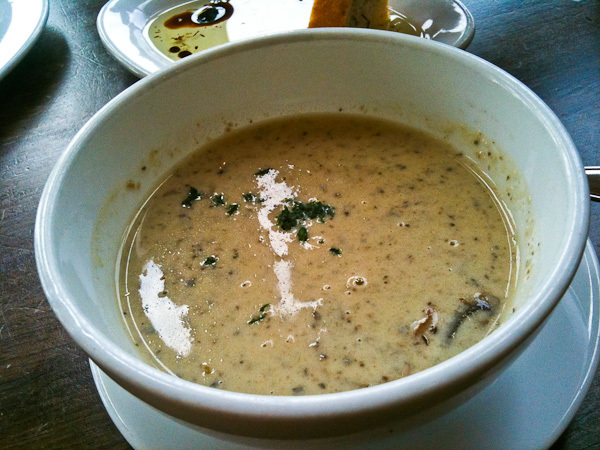 The soup of the day, which was Mushroom Soup, was pretty good. Unlike those that you normally get at fast food outlets, their bowl of soup was filled with bits and chunks of mushrooms. Fragrant, tasty yet adequately soupy, it went well with the free pillow-soft breads that they usually give as appetiser/snack. 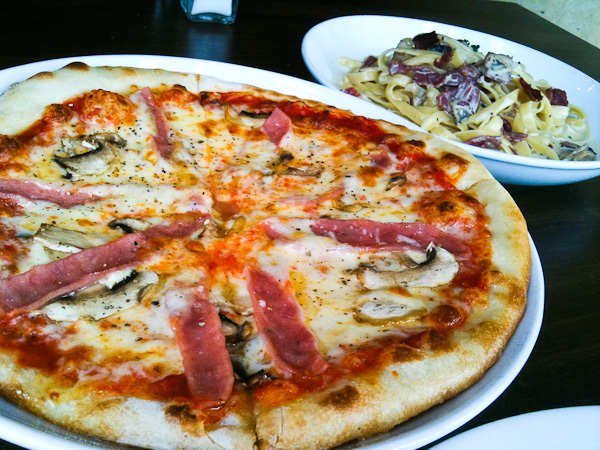 With the given options (click here to look at the menu), Classic Carbonara and Ham & Mushroom Pizza were selected from the menu. Being a big fan of fettuccine (and any broad-type of pasta), it’s no brainer that I will automatically order one if given a choice (and freedom). The pasta dish faired pretty well as the parmesan cream sauce was rich and nice, coating each strand of the al dente pasta evenly. It’s good to know that they didn’t skimp on the ingredients as there were good amount of beef bacons and sliced button mushrooms in the dish. 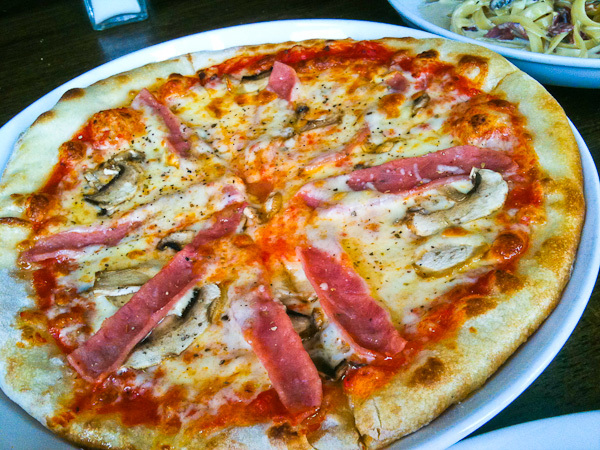 Although the portion of the pizza was not as big as one would get in ala carte menu (I think), it was good enough to be shared among two pax. The ingredients of the hams and mushrooms were slightly less (I expected it to be such, anyway), but it was alright as the smothered tomato-based sauce and mozzarella cheese were tasty. It’s akin to eating a Magherita Pizza (without the basil, of course) with the hams and mushrooms playing the supporting role. Nevertheless, it was still good as the pizza crust was doughy yet sufficiently thin to eat it like New Yorker style. 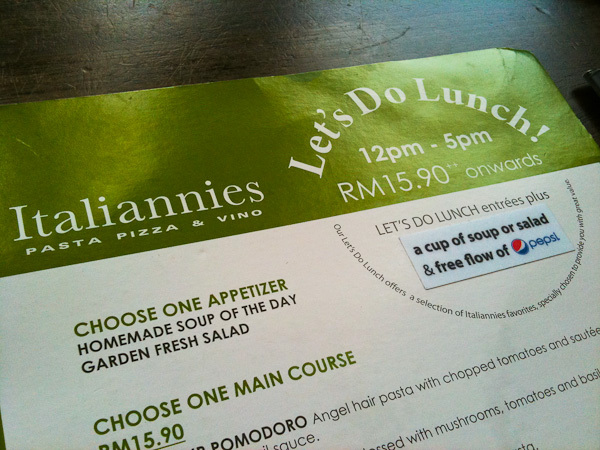 All in all, for RM15.90 (onwards and excluding tax), I honestly think the set lunch offered by Italiannies is pretty good deal especially those craving for Italian food during lunch time. Their set lunch is available from 12PM to 5PM on weekdays. I couldn’t recall any other restaurants offering such a long period/duration for a set lunch meal.